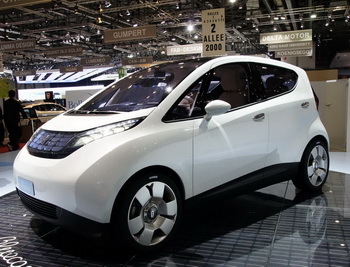 Pininfarina's innovative electric city car project has survived the Italian designer's financial turmoil and is now surging through the development stage and could hit the streets as soon as this autumn, was the word from the Geneva Motor Show. Pininfarina's innovative electric city car project has survived the Italian designer's financial turmoil and is now surging through the development stage and could hit the streets as soon as this autumn, was the word from the Geneva Motor Show. The Bluecar as it is known, is a compact urban car with four seats, five doors and an automatic transmission, and is a joint project between Pininfarina and French conglomerate Bolloré. At the Geneva Motor Show last week, the French financier Vincent Bolloré told Reuters that the Bluecar could be available by the autumn, subject to successful crash testing. With an array of leading manufacturers putting electric cars at the hub of their future plans, including French giants, Renault and PSA Peugeot- Citroën, Pininfarina and Bolloré hope to be at the forefront of their development. Bolloré told Reuters at the show that two battery plants that have recently been inaugurated in France would each have an annual production capacity of 15,000 30 kWh batteries per year by 2013. "With this capacity we can make 30,000 Pininfarina cars or 10,000 buses, or 60,000 small urban vehicles," Reuters reported Bolloré as saying, he added that with banking support the troubled Italian design company is now free from problems. "Our objective is a mix of the three," he added. Bolloré Group is providing the batteries through its experience in this sector and the car will use the latest state-of-the-art lithium-metal-polymer batteries which are regarded as more advance that the lithium-ion batteries that most carmakers are pushing towards production use. The Bluecar's battery gives it a range of 250 km between charges, well in excess of the 40 km clocked up on average by a driver in an urban environment and can be recharged by simply plugging it into a public power outlet or a standard domestic power socket. It takes six hours to recharge the car's battery from a standard power socket but only two hours on the future fast-charging outlets. 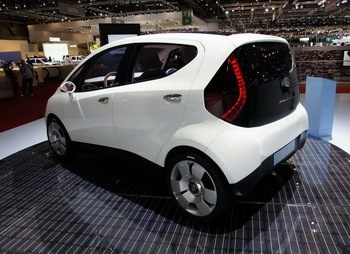 If need be, the batteries can be fast-charged for five minutes, giving the car enough power to run 25 km. Bluecar will feature a top speed that is electronically capped at 130 km/h and enough acceleration to get it from 0 to 60 km/h in 6.3 seconds. Meanwhile Pininfarina's CEO Silvio Angori told Reuters that he foresees 2,000 examples of the Bluecar hitting the streets next year. Initially the electric car will be trialled in a mass rental scheme before purchase and leasing options come on stream. Angori also sees Pininfarina's on-going losses greatly reducing this year.